Samsung has just announced a new Android device, the 5.3-inch Galaxy Note, which challenges our perceptions of what is a phone. This is the first smart phone to go past the 5-inch barrier, the Dell Steak featured a 5-inch screen but it has now been discontinued. The Galaxy Note however doesn’t feature just any type of screen but a surely gorgeous 1280×800 (that’s 285ppi) Super AMOLED (not Plus) screen together with a stowaway pressure sensitive stylus, named S Pen, which can be used for drawing and note taking. In fact Samsung will include a number of applications which will take advantage of the S Pen while also releasing an SDK for third-party developers. The phone will need a lot of power to drive that kind of resolution, and that will be brought by an unidentified Samsung dual-core 1.4GHz processor powered by a large 2,500mAh battery. Despite the size, the phone will weigh 178g (6.3 oz) and measure 9.65mm (0.38 inches) thick. 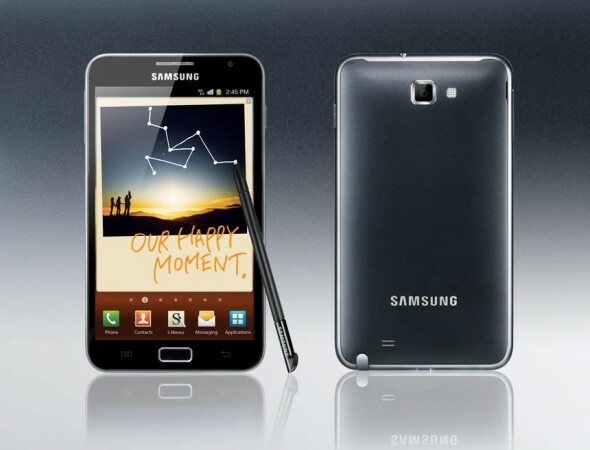 The Galaxy Note will run Android 2.3 together with Samsung’s TouchWiz UI. Front and back cameras of-course with 2 and 8-megapixels resolution each, with the rear camera able to shoot 1080p video. The Note will support HSPA+ but we are hearing it will also be LTE-capable. We know that everyone will say its too big for a phone, but we like, no, we really like big screened phones, and we’d love to get this baby into our hands; hopefully we won’t look too silly talking to a big piece of slab.